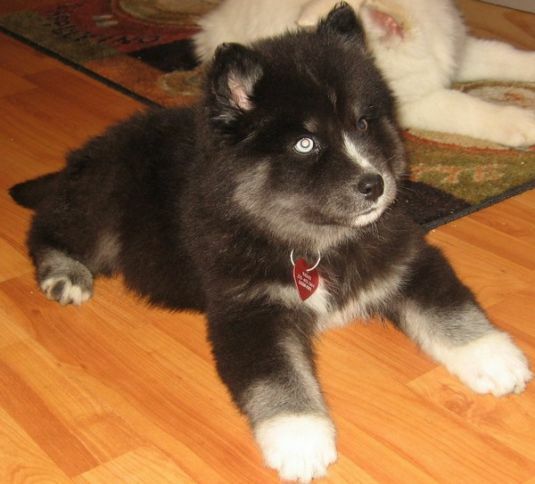 Nayati stole my heart the first time I laid eyes on him, he looked like a little black bear wearing tube socks! I sent my husband a picture of him from my phone, and his response was "What are you waiting for? You know you're going to have to bring him home! See I had gone to pick up my solid white woolly Siberian Husky puppy I had finally found, well both of them have a great home now and are still as beautiful as they were that lucky day! I want that puppy ! he is like a teddy bear :)hahaha CUTE! Beautiful little bear : ) Picture radiates a feeling of happy.